Carrots, mmm! 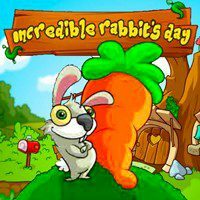 You should help this cute rabbit to be satisfied and reach the huge carrot. Do you think that it is so easy? Well, then let us check it! Just use arrows to move and down arrow to speed up. Avoid any impediment and become the winner of the game. This cute rabbit is waiting for you! There are a lot of levels that you have to pass. Do you know what actually rabbits like? Yeah! This is carrot! So, as you have already understood, this rabbit must reach the food as better as possible. But! There are so many troubles... Like owls, hamsters and other animals that live in the forest. So, if you are not a yellow-belly, then this game is for you! Just use the arrow keys to move and up to speed up. If you are ready for such a challenging game, so start it immediately!